What Are the Benefits of Green Tea With Rose? Green tea is made from the unfermented leaves of the Camellia sinensis shrub. Rose tea is made from either rose petals or rose hips, the swollen seeds. Green tea with rose is the combination of green tea leaves and dry rose petals or hips. Both green tea and rose hips provide many health benefits. 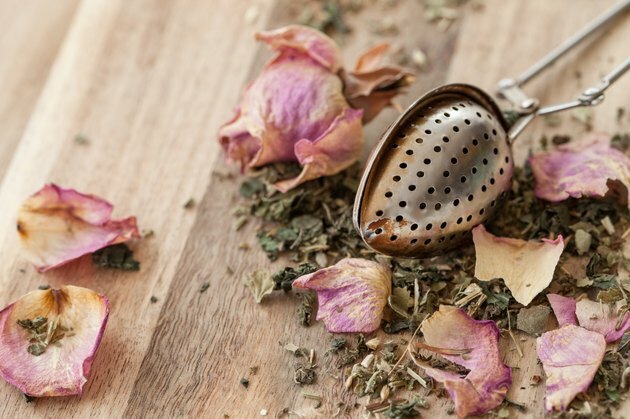 For centuries, green tea and the rose have been used for therapeutic and medicinal benefits. Green tea with rose contains antioxidants, bioflavonoids, vitamins and alkaloids. Together, they create a tea that delivers calming, infection-fighting, immune-boosting and cleansing properties. Green tea has the highest concentration of polyphenols, which are powerful antioxidants, according to the University of Maryland Medical Center. The World's Healthiest Foods website reports that green tea's highly potent antioxidants are created because of the catechin phytonutrient epigallocatechin gallate, or EGCG, which is believed to be the reason for green tea's health benefits. Rose hips are full of vitamin C, more than any citrus fruit, according to the Gayot website. The Rose Magazine and the Health and Soul websites say rose hips are high in vitamin C, supposedly containing more than 60 oranges. Antioxidants have been shown to fight against free radicals, the perpetrator of many infections, cancers and diseases. A study published in the February 2005 issue of the "Journal of Nutrition" found that through a series of experiments, green tea was shown to slow fat digestion and decrease triglycerides in the blood, according to the World's Healthiest Foods website. The rose has soothing properties, easing anxiety and stress, often associated with heart disease, according to the "Rose Magazine" website. Another study published in the 2004 issue of the "Archives of Internal Medicine" found a risk for hypertension decreased 46 to 65 percent in those who drank oolong or green tea as compared to those who did not drink tea at all, according to the Harvard Medical School's Health Publications. Adding rose into green tea can help boost heart health. According to the Gayot website, rose hips help to reduce inflammation, stiffness and pain in the joints. Green tea also reduces inflammation and may help with arthritis by slowing cartilage breakdown, according to the University of Maryland Medical Center website. A study presented at the International Osteoporosis Foundation World Congress in Toronto, Canada, in 2006 found that drinking green tea increases bone mineral density significantly. Another study published in a 2007 issue of the "American Journal of Clinical Nutrition" found that bone mineral density was 2.8 percent greater in tea drinkers than non-tea drinkers, giving bone benefits similar to calcium or exercise, according to the World's Healthiest Foods website. Rose tea has been used to flush the body of toxins, fight bacteria in the digestive system and help aid with diarrhea. The rose petals may help restore balance in digestion, acting as a diuretic. According to the University of Maryland Medical Center, green tea may help with inflammatory bowel diseases, such as Crohn's disease and ulcerative colitis. Green tea with rose gives the double benefit of reducing inflammation in the intestines and easing digestion.